Reiki is comprised of two Japanese words, rei and ki. Learning how to access and use this energy is your birthright. Upon discovery of this energy, you will gain access to more of your innate power. Reiki is for everyone, not just “healers” and will improve your life when acknowledged and used. My goal in sharing this material is greater acceptance of inner power in relationship to the outer power. This leads to harmony and increased awareness of how to interact with unseen energy and the elephants in the room. You can ask Reiki to flow through you whenever and wherever you need a boost. By you lighting up with this healing energy, you become more dynamic in all situations you encounter. Remember to adhere to and respect boundaries before sending or directing this powerful energy to someone or something. Always get consent. How can you get consent from someone or something that you cannot verbally communicate with? Connect with it mentally or with your felt sense. Ask it on the unseen realm. This is easier to do than it is to explain. The way I have explained this to my children is like this: Before we pick a flower, rock, feather, or leaves from a tree, we ask permission. Ask and then be open to the first impression you get. Soon you will understand what is a “no” and what is a “yes.” It is the same thing when we want to send or direct Reiki. Believe it or not, everyone/thing does not want or need healing. We all need to go through our own shadows and experience some level of suffering. When we are ready, healing is standing before us. Like Dorothy in the Wizard of Oz, healing is as close as the shoes on our feet and has been with us the whole time. Think about this in your own life. How have your greatest challenges been part of your evolution? How would your life be different had you been “saved” or somehow removed from your challenges? I ask you just to look at these things and begin to see the beauty in your continued wholeness. When working with yourself and others, honor the process and allow the natural unfoldment. One of my best teachers used to repeat constantly, “Be where you are.” Do not try to rush your evolution or expansion of consciousness. Do not rush others. Honor the self as a Divine Master. What is the difference between “be where you are” and being “lazy”? When there is a call, you answer. If the call doesn’t make sense, you seek guidance. Dig deeper and take action when you are called to. Move on when there is completion. If there is a call and you just sit on the couch and pretend that you don’t hear it, this is what I would consider being lazy. Everyone is entitled to making their own choice in this. If your friend, lover, family member is being lazy … so what. That is their choice. You are totally entitled to just sit on the couch sometimes, too! Expansion and evolution are inevitable. What we do to increase our awareness and openness to this expansion is 100% our own choice and free will. My spine grows roots into the heart of the Earth and the crown of my head grows energetic branches that connect with the heart of the galactic core/cosmos. As I breathe; inhalation connect to Earth all the way up to the sky and filling up with Universal Life-Force Energy. Exhalation, ULF Energy sweeps through my Auric Field. Now I am running clear ULF Energy and can send this energy through my hands for personal use or to offer to another. I place my two hands in prayer position at my chest. My Reiki invocation sounds something like this: “Reiki Energy Flow, turn on, activate. Thank you for allowing me to access and channel this energy for the best and highest good of ____________ (whoever or whatever I am working with).” I almost always invite my personal spirit guides and teachers into my field when I work. At the bare minimum, I call on my higher-self, healing assistants, and the natural elements of creation. Depending on who I am working with, I may involve them in participating in grounding and clearing. I will guide them on a variation of the tree visualization in sync with their own breathing. After they clear away any less organized energy through this phase of the session, energetic density or “blockages” are easier to pick up on. Sometimes, people don’t want to participate in this process and that is totally fine. Learning discernment in whether to involve your client and at what level will come with experience. At a minimal, guiding them to regulate their breathing is very helpful. One practice that is helpful is asking them to take a deep breath in and tense up as much of their body as possible. On a big, over exaggerated exhale, they release all tension and melt into the table, floor, chair, yoga mat, or whatever they are on. pillar 1 is how we ground and calm ourselves. Pillar 2 is asking Reiki to flow or turn on. Pillar 3 is allowing intuition to guide the treatment. Now you are ready to explore energy! There is an actual treatment plan as you are learning to use energy but once you are comfortable and have had some experience, you will listen to your intuition and move in whatever way you are sensing. The textbook plan has you start at the end and scan energy above the person’s body. Once you scan, you will go over each part of the body sending energy into each part being sure not to overlook any area. There is a particular way to hold the hands which feels slightly cupped in order to gather and direct maximum energy. After you have gone over every part, you will spend more time in any one area that you sense a particular calling to. This is communication. Listening to what the body is saying will develop with practice. Do not over think, or even think at all, if possible! Practice feeling and allowing. ULF Energy has supreme intelligence and will do exactly what is best for whatever is receiving it. When you start to think, judge, or otherwise notice your inner critic come in, thank it for wanting to help. Tell this part of you, “I value your input and continued service in my life. Right now, we are allowing Reiki to flow and logic is not needed. I will let you know when to come back online.” This logic and reason part has an important role in your life. If you treat this with respect and honor, you will be more successful in integration on many levels. If you get “stuck” in a session or feel unsure about what to do, relax. Refocus your breathing with any of your favorite techniques. Get out of your way. Remember that Reiki is doing what it needs to. Remove your attachment to any expected outcome. Your job is to hold the space and let Reiki flow. I personally have many techniques that work for me in different situations of “stuck”. One of my favorites is calling on Archangel Michael or another Master energy to come into my field of awareness. Do a little research, experiment and follow your intuition and guidance. Combing or smoothing aura after self-Reiki. This step is vital for bringing your session to completion. During this time, you may thank your guides, angels, beings of light, helpers, teachers, and Reiki guides for assisting you in your healing. Thank the client for allowing me to work with them. As I am walking out, I thank my guides and ULFE for their love and support in my work. Respect and Gratitude. I go to the washroom and wash my hands, allowing everything from the session to be released. When the client comes out of the room, I ask them how they feel and give any impressions or follow-on self-care information. This all will demonstrated in class. Cleansing your energy body or the energy in your environment after your session is simple. With intention for clearing, burn sage through the rooms in your space. Leaving a cracked window and open doors for ventilation for smoke and stagnate energy to escape, wave the sage in a circular motion. Intend for energy to be broken up and leave the space. You can also wave this sage around your body. This is a most popular method as sage is easily obtained and the process is pleasant and quick. Energy is beyond good and evil. It is Energy. How we perceive and what what we do with energy is what matters. This concept takes time to develop and understand. Please explore this for yourself. For 21 days after your Reiki attunement it is necessary to do self-Reiki. It may be helpful to use a picture with the self-Reiki hand positions and keep it in your office, bedroom, or any place you can devote some time (20 – 30 minutes) to your self-healing practice. During the 21 days, it is useful to make journal entries after your sessions to note any changes, insights, and energy you notice. After the 21 days, you may develop a shorter variation to keep utilizing the Reiki self-healing system. During this 21-day period you to get to know your own energetic signature and discover your patterns. When working with others, knowing yourself can be a most valuable tool. September 9th 530-9 pm Reiki I Sign-up here. October 7th 530-9pm Reiki II Sign-up here. 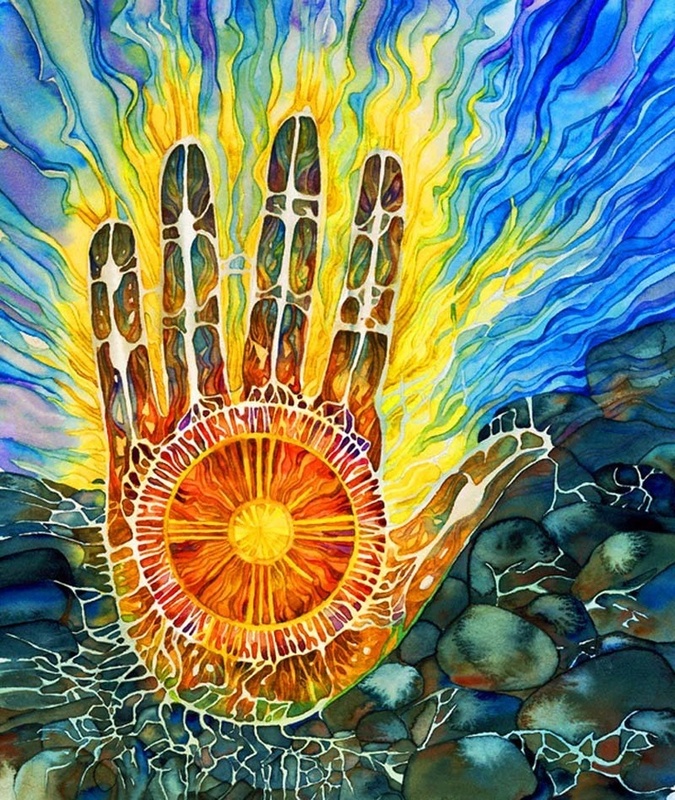 December 1st 530-9pm Reiki III Sign-up here. Anjani has been practicing the healing arts professionally for over 17 years. She got her first attunement in India in 2008 and practiced regularly for 7 years before getting the level III teachings. In April 2015, Anjani received attunements as level III Master/Teacher of Reiki from Shamanic Practitioner, Katie Weatherup and has been sharing attunements regularly since.